I think Healer's Hawk is going to be a key part of Mentor curve-outs for Boros in Limited. Just attack with it and ever-larger Mentors and it'll likely be tough to deal with. I think it's very unlikely to see any Constructed play. I like that thought for limited. In post 7552, Inferno390 wrote: I like that thought for limited. I would agree with this. It seems like an interesting enough card. Yeah it is. Super cheap for removal. I think Chromatic Lantern’s going to be a big card. I’ve built a Bant Historic deck for banter that is actually mostly artifacts and good colorless lands with a few colored things mixed in. Just for banter (ha, BANTer), nothing serious. But it actually plays okay, and Lantern might be one of he cards it need to go somewhere. Plus it’s going to bring some tri-color decks some more power. In post 7553, DeathNote wrote: Assassin's Trophy is bonkers. heck yeah. 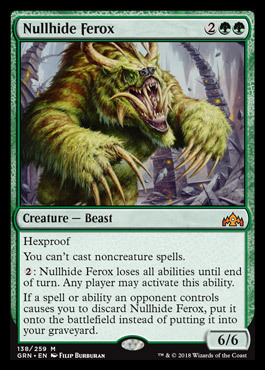 I'm extremely excited to see how this card impacts modern. I've been slowly working towards completing Mardu Pyromancer, but this might just bring Jund/Abzan back into the format. This will also be very good for standard. Lots of support for Surveil. are you really gonna hold back that many cards for your induced amnesia to exile enough? Thinking maybe Maximum Velocity in trade for Lava Axe? Lava Coil for Lighting Strike? Sideboard Niv-Mizzet and Lighting Strike? The viability of that list is hugely dependent on where you’re playing. At a reasonably competitive standard FNM it’s not going to be good enough. At the kitchen table with your buddies who are all as new to the game as you it might work with a couple changes. Ask yourself what is your deck trying to do? Is it trying to put spells into your graveyard quickly and play creatures that synergize with that strategy? Try some cheap cantrips like opt, chart a course and tormenting voice. Also include the mini Crackling drake that is Enigma Drake. Is it trying to turbo ramp into big finishing spells like Apex of Power and Expansion//Explosion? Try some better artifact ramp like chromatic lantern and guilded lotus. Also considering cutting some of the midrange creatures like Crackling drake for more early interaction. That list feels stuck between a couple different strategies. I’ve found it helpful to ask myself what does my perfect opening hand or curve out look like? Those questions should lead you towards a strategy you can focus your deck around. Anyone else planning on going to SCGcon? Will see play in my Red/White equip deck. Probably to replace my Benalish Honor Gaurd. Which might be enough to warrant a Blackblade play? I’m running a bunch of other Legendary already, so this is just icing on the cake. Not quite. It's playable filler in limited. An aggressive boros deck in particular will like cheap creatures to grow with mentor. i went 3-1 with boros at the prerelease! our prerelease had 6 dimir, 5 selesnya, 3 izzet, 3 golgari, 2 boros. The finals were ID'ed (for a 4-0-1 record) by either two dimir or a dimir and a selesnya deck (not completely sure on one of them). I was one of the two boros decks, which both went 4-1. MTG Arena is p cool and has gotten me to play some magic again, even if yeah the deckbuilding interface is garbage. Wooo pre-releases were awesome. Multicolored sets are sweet. And I won enough prize packs to host a draft this week.